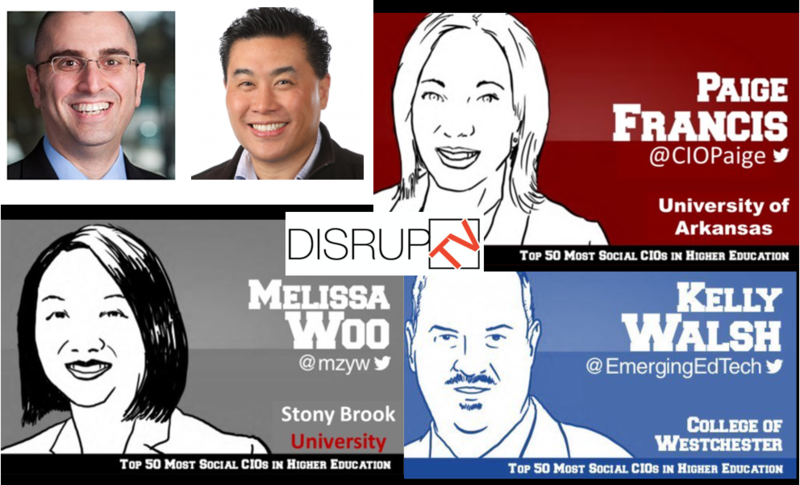 Every Friday at 2 PM Eastern/Pacific, Vala Afshar and Ray Wang interview CIOs from across the breadth of industry on their “DisrupTV” web show. The show is also broadcast to multiple podcast outlets (here it is on iTunes). Afshar and Wang are major influencers in the world of information technology, business, and marketing. Vala is the Chief Digital Evangelist for Salesforce.com and R “Ray” Wang is Principal Analyst, Founder, and Chairman of Constellation Research and author of the new best selling book Disrupting Digital Business. It was my distinct pleasure to join Melissa Woo, SVP of Information Technology & CIO at Stony Brook University and Paige Francis, Associate CIO at the University of Arkansas on Friday, June 30th, for an interview with Ray and Vala. Can we think long term when planning for what our schools need, or is short term more realistic? How will emerging education models impact higher education? How technology is enabling a “flattening” of teaching and learning, regardless of the delivery model? The power of technology to help to “democratize” access to education, regardless of socio-economic status, access, location, etc.? Vala Afshar followed up the interview with this article on the Huffington Post, “15 Lessons From The Most Social CIOs in Higher Education”. If you're interested but don't have the time to watch the video, this article provides a great set of takeaways! If you're keeping up on how technology is impacting the world of education, you're sure to appreciate this conversation. And if you are in IT management, you're sure to enjoy DisrupTV! Subscribe to the podcast, or on YouTube, or check them out on Vimeo today. 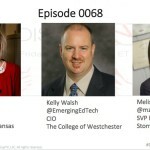 I'll be on DisrupTV today at 2 PM EST talking EdTech and Disruption!